Relax, it’s just an adverb! Use adverbs sparingly–or, better yet, not at all! Adverbs can’t do anything a good verb couldn’t do! Adverbs are the mark of an unskilled and lazy writer! 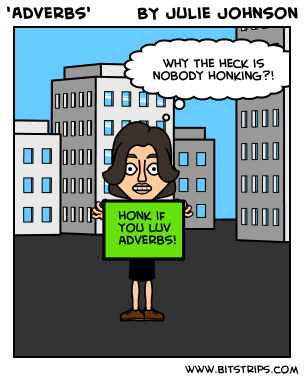 Boo, shame on you, adverbs! And shame on you writers who use more than 1 adverb! Boo! Hiss! Boo! However, like all other writing advice, I tend to take this with a grain of salt. My attitude is certainly more relaxed than others would have it. While I don’t think every sentence needs an adverb, neither do I think we need to avoid them as if they were publishing poison; a serious offense worthy of the Grammar police. Yes, every word you lay down in your novel should be there ‘for a reason’. Yes, examine your word choices and and choose judiciously. But some of those words you choose can be adverbs, for gods sake! They won’t bite! Would everyone please just relax!?! These are all good words, to my mind. Am I going to keep them all? I don’t know. It’s only a first draft. Maybe I’ll change them in re-write. Or maybe I’ll keep them. I like them, frankly. I think they have *pizazz*. Do I sound defensive? Yes, I guess I am! I am defending the adverb (and the exclamation point and the word ‘quite’) from eventual extinction! Use them, damn it! Use your adverbs! Exclaim away! Be ‘quite’ rebellious! Go for it, gleefully! Joyfully! Judiciously! Select one of those dusty adverbs squandering away on the top shelf, rescue it from dereliction, give it a shampoo, cut and a blow dry and see how it sparkles! Go on, give it a try! I’ve also got bucketfuls of exclamation marks to give away, free! Sprinkle those amongst your prose like little fairy gumdrops, why don’t you? Just for the heck of it! See what it’s like! PS. How about you? What’s your take on adverbs: do you think they’re evil incarnate or something more benign? Please leave your comments below!